Waylands Country House is an intimate and exclusive retreat on the Northern slope of the majestic Katberg Mountain. 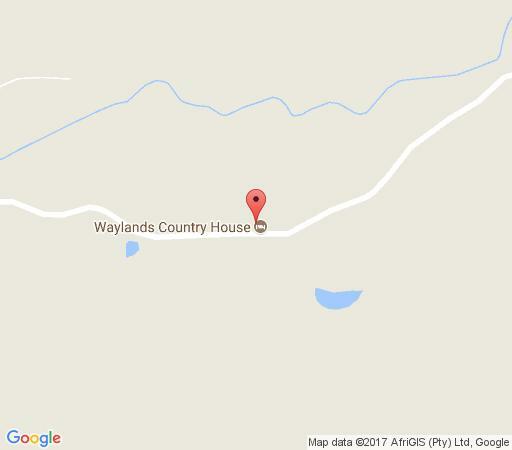 Situated near to Malaria Free Mpofu Game Reserve, Waylands is a 1100ha private estate, National Heritage Site and family home to six generations. The Art Nouveau Manor House set in beautiful established Gardens, is graciously furnished with the owners extensive collection of antiques, memorabilia and art. Breathtaking mountain vistas, spellbinding starry nights, snow capped winters and fiery African Sunsets. Waylands Country House perfectly blends the splendour of the Eastern Cape with romantic luxury and distinctive charm. Mpofu Game Reserve has a steep terrain and varied rainfall supporting a remarkable variety of game and extensive tracts of rare indigenous forest. Self drive or allow us to arrange an unforgettable game drive. Our immediate area is rich in frontier history and national monuments. Hike in pristine nature, experience ancient san rock art or just be enchanted by our sacred land. The spacious Manor House boasts teak paneled Dining Hall and Drawing Room, an inviting Coffee/TV lounge, intimate Smokers Lounge with functioning hearth and two large verandahs ensure guests privacy and unparalleled comfort. A sumptuous Master Suite and three other elegantly appointed double bedrooms complete the picture of colonial luxury at its very best. In the historic Carriage House alongside the Manor our trained chefs celebrate a fusion of Pan African and Fine Country Cuisine. The freshest ingredients are sourced from our own organic vegetable Gardens. A luxury double bedroom with shared access to second bathroom with bath & shower. A luxury double bedroom with shared access to second bathroom with bath & shower Rate includes breakfast, high tea and dinner. This Suite has a Kingsize extra length bed a private lounge en suite bathroom and door onto the front verandah. Bookings for this suite gives you complete privacy with no other guests. All meals is served from the Carriage House Restaurant. A luxury double bedroom with shared access to second bathroom with bath and shower. Rate includes breakfast, high tea and dinner.